I have been wanting a full-scale travel-electric guitar for some time but I have never come across one that really ticks all the boxes for me. So I was wondering if I could potentially build one myself from modifying an existing DIY guitar kit with limited wood-working tools? I'm also thinking of adding a little handle on the body for the fun of it. Due to my relationship with a particular supplier, I can get these DIY kits at cost price. I would like to challenge myself at getting this done with a budget of $50 to spend additional on top of the guitar kit. 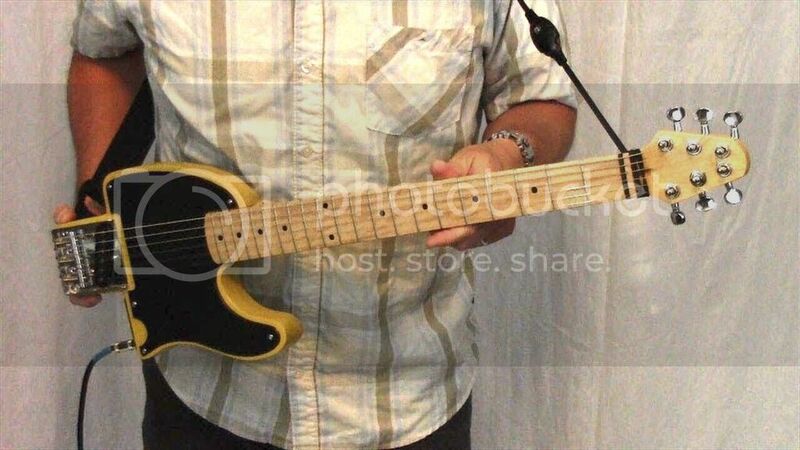 For the Tele kit, I was thinking of cutting the body straight down (including through the metal plate) just after the volume knob since I do not care about the tone knob at all. Then, glue on a small block of wood to fill the bottom. I will re-drill a new hole for the jack. If I could get this done cheaply enough, I may even make a spare as a backup. This guitar will solely be for practicing while I'm traveling so it doesn't have to sound top notch. What are your thoughts, guys? How cheaply could you make a practical travel guitar like this? Last edited by KevinTJH; 01-10-2019, 06:19 PM. Trail and error is the only real way to find out. I just laid out a laminated strat-clone body that I'm going to cut down to the bare minimum dimensions to hold pickups, bridge and controls. I'll cut down a pickguard to match. 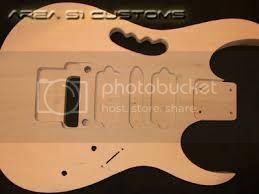 All straight cuts, round over the edges, bevel the pickguard cuts. Same idea though not as elegant. ...just noticed your tele-style kit description says "set neck"
Will do! It probably won't be for a while though, but I probably will if I get stuck along the way too. "Not as elegant"? I think mine will probably be more on the tacky-side, but I don't mind the home-made look at all. Yes, you are right about the description. I should definitely bring it to their attention because it's rather misleading. Seems like a headless guitar design would be suited to a travel guitar. this. Somebody posted a YT where the guy progressively lops off sections of an electric. Net result, nothing that matters. What features do you think makes for "travel"? That is the question I would ask. I assume it has to fit in the overhead bin on an airplane - does that mean the size is 9 by 14 by 22, including handles and wheels? Since this is an electric guitar forum I assume you will have a separate amplifier - does it need to fit in the same carry on package? What is the target weight? I assume it has to be ergonomic enough to actually be playable (that was one of the biggest objections to the old Martin Backpacker - you couldn't hold the darn thing). I assume it has to sound reasonably OK - however of course with an electric guitar that is just the choice of pickups. If it requires assembly and dissassembly then probably the strings should remain on it. If anything comes off (like the neck) does the design assure that it goes back with the correct geometry? Obviously it needs a case to fit and keep it from being all scratched up - will that be custom made or are you designing to fit something available? When you get to where ever it is you are traveling to do you plan to sit around in a hotel room and play, gig, busk, play a huge venue with a famous band. How often will you travel with this instrument - yearly, monthly, weekly. What do you have against checked (and insured) luggage for a real guitar? How about shipping it ahead by UPS to your destination? Renting an instrument from a music store when you arrive? The whole idea of a dedicated "travel guitar" seems kind of silly to me. If I was a professional musician I would want my good axe and I would know how to safely ship it. When I used to travel a fair amount on business I would take my mandolin, it is small yet a full sized instrument in its class, it was reasonably quite so I could play it in a hotel room without complaints, since it was a second instrument for me taking it on trips forced me to practice. It was usually possible to sit in (with acoustic players) if there was a jam going on. Last edited by gardo; 01-12-2019, 01:17 PM. Where'd ya get that fugly Tele? Damn customer wanted it that way. That is a very valid question as it differs from each individual. To me, it’s overall length (being able to fit as a plane carry-on) and lightweight (as a bonus). It’s pretty important to me that the guitar “feels” like a normal guitar as much as possible, that’s why I never took much of an interest from Steinberg’s and Hofner’s travel guitar. I would prefer the standard 24.75 and 25.5 scale length as I mostly play in lower tunings. The “perfect” travel guitar for me would be one that has all the usual curves and contours of your standard guitar, while having all the areas that your forearm wouldn’t notice, cut off. That’s why I’m pretty keen to mod a guitar kit. I also think it’ll be a fun little project! I travel a bit for very short periods at a time so I want something convenient. My expensive leather hardcases get too much of a beating every time they come with me. PS: I got the Vox Amplug 2 and it’s amazing. I’ve also got an iRig 2 for the digital amps I run on my iPad.